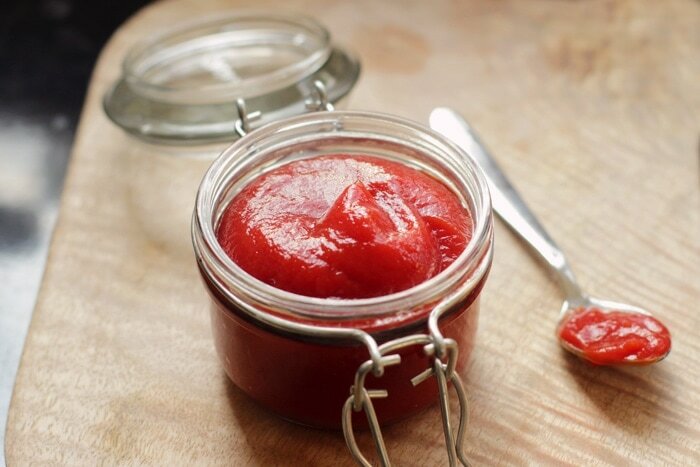 Homemade Ketchup in Just 5 Minutes! Homemade ketchup in just 3 steps – Easy, rich in flavor and definitely healthier than store-bought versions. 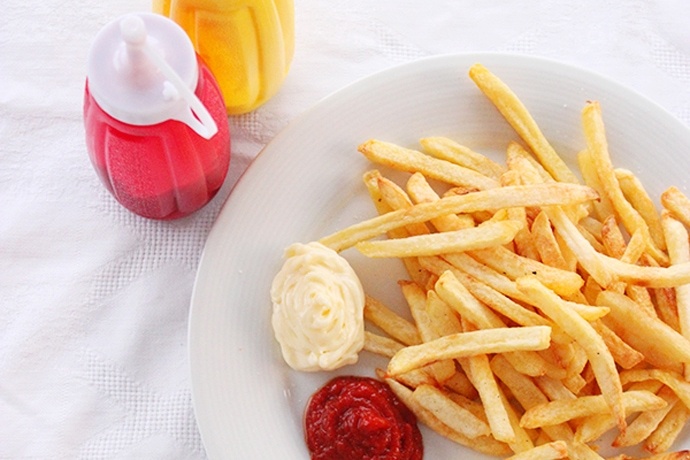 Probably the most famous sauce in the world, ketchup is super versatile and can be used in a lot of different recipes, or simply with french fries together with some good homemade mayonnaise. An all-time-favorite among kids and grown-ups, ketchup is a staple for so many dishes, just think about chunky hot chips, hot dogs or burgers. They just wouldn’t taste the same without a good dose of ketchup. But have you ever tried making your own homemade version? Store-bought ketchup contains some nasty ingredients like high-fructose corn syrup and a list of preservatives. 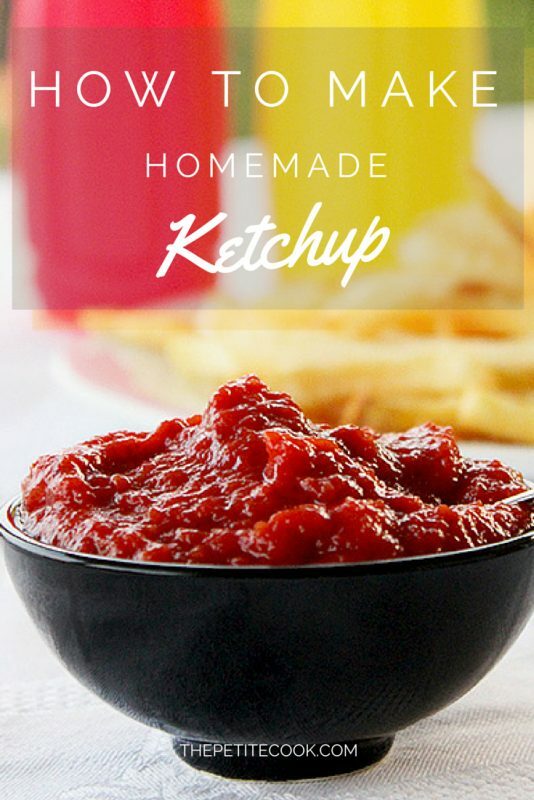 Homemade ketchup on the other hand is cheaper, contains only a bunch of natural ingredients and spices, takes very little effort to make, tastes so much better and it’s healthier for you. 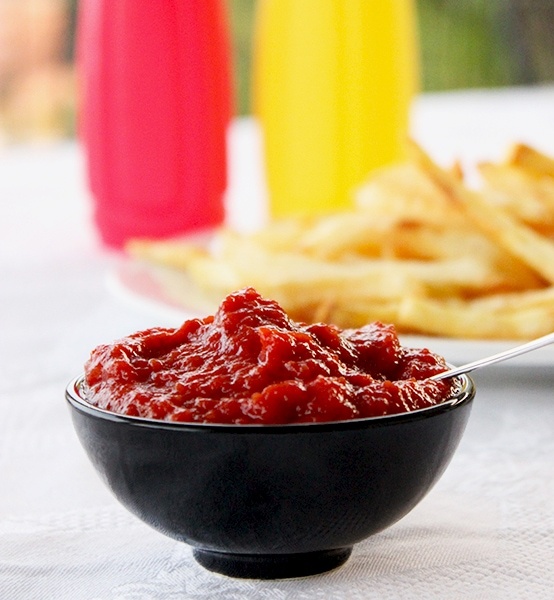 Some pretty good reasons to choose to make your own ketchup over buying it. There are a lot of variations on the original ketchup recipe, which involve the use of various spices or different kinds of vinegar. I try to keep it as simple as possible, with fewer ingredients and just the basic spices. Once you master the basics, it’s easy to get carried away and try new ingredient combinations, or add some fresh herbs like I did in this spicy basil ketchup. Over the years I’ve tried both the slow-cooked version, which remains a little bit more thick and grainy, and the quick no-cooking version, where all you need to do is throw the ingredients in a blender and mix until smooth. Although the latter is quick and effortlessly easy, the slow-cooked homemade ketchup uses canned tomatoes instead of paste, and delivers much more flavour, so it’s hands-down my favorite choice. 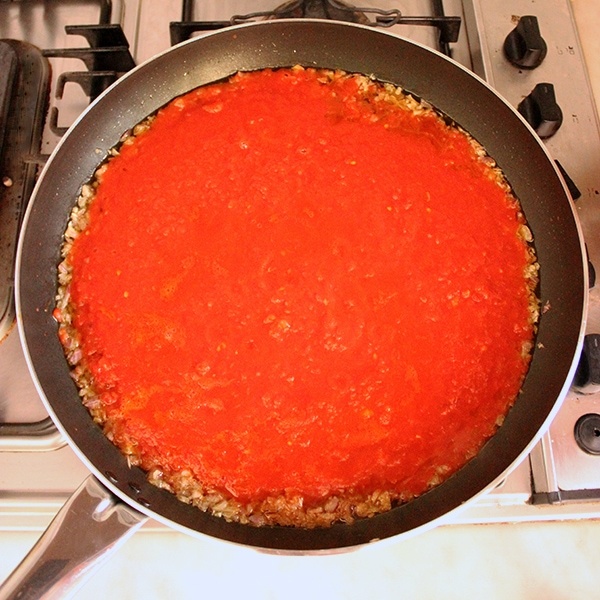 Heat a large saucepan with extra virgin olive oil on med-low heat, add chopped onion and sautée until translucent. Then pour in the creamy plum tomatoes. Add brown sugar, tomato paste, vinegar, cinnamon, black pepper and salt to taste, and mix well. 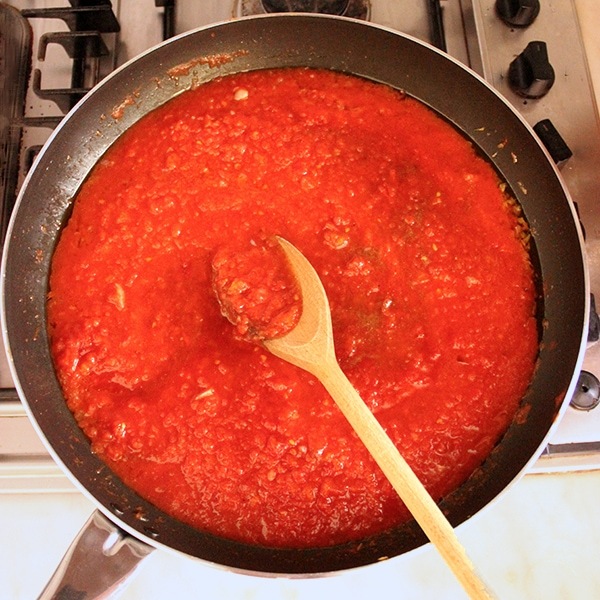 Cook for about 40 mins on very-low heat, stirring often, until the sauce thickens. Once ketchup is ready, you can add nutmeg and chili powder according to your taste, to give your sauce a little bit of heat. 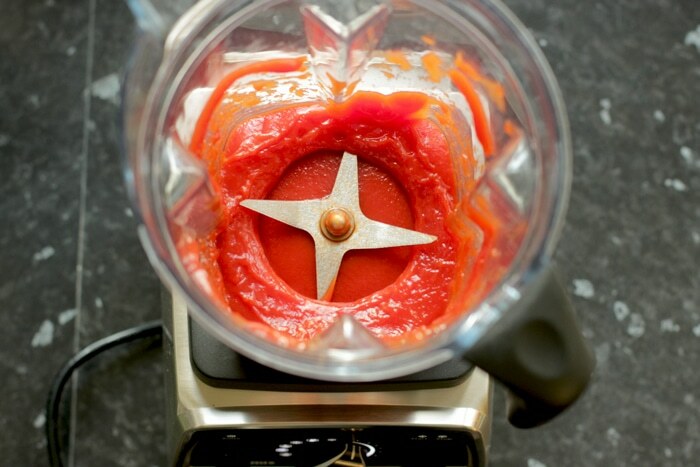 Then, simply blend all ingredients in a food processor or blender. Pour your homemade ketchup into sterilized bottles, then seal tightly and place in the fridge until needed – it should keep for about six months, but it tends to disappear within a week from my fridge. 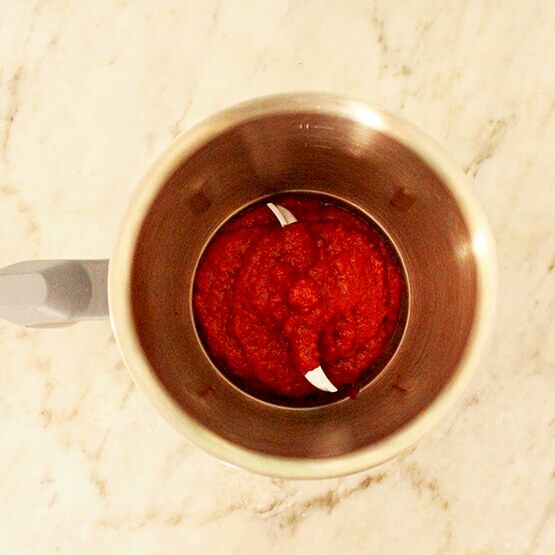 To make a super quick homemade ketchup, go for the no-cook route, which calls for tomato paste and a little water instead of canned tomatoes. I use this method everytime I’m in a rush, it’s a bit mild in flavour but still delicious and still better than store-bought version. This ketchup takes zero efforts. I throw all ingredients in my Vitamix and blend until combined into a smooth texture. I like to add a pinch of nutmeg and chilli powder at the end for a spicy kick, like I do for the slow-cooking version. Store in an airtight container and place in the fridge until needed, up to 1 week. And while you’re here, why not check out how to make homemade mayonnaise? 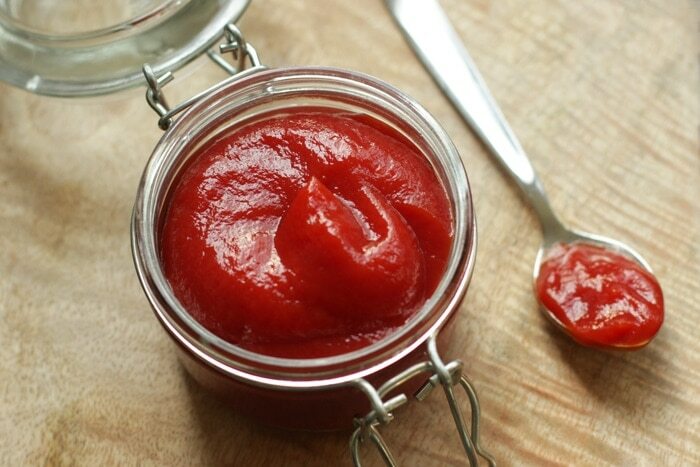 How To Make Homemade Ketchup in Just 5 Minutes! Homemade ketchup in just 3 steps - Easy, rich in flavor and definitely healthier than store-bought versions. Place all ingredients in powerful blender. Add a pinch of nutmeg and chilli powder at the end for a spicy kick, or leave the ketchup plain. How much vinegar and maple syrup should be used in the no cook version? It says ? Cup. Wonder if the slow-cooked version could be made with FRESH peeled and seeded plum tomatoes? Hi Pat, I never actually tried with raw tomatoes, but I feel the taste would be a bit on the acid side, much more similar to “salsa fresca” rather than ketchup. Why not share the yield with us? Does this recipe make 2 cups or 2 gallons?